The FDA has just cleared a brand new contact lens technology that is sure to disrupt the specialty contact lens market. The technology is called Tangible Hydra-PEG coating, and it will first be released in the USA. Tangible Hydra-PEG coating refers to a very thin sheet of polyethylene glycol (PEG) polymers that are placed over a person's contacts. This film of polymers is said to dramatically improve the contacts' lubricity, flexibility, and resistance to wear and tear. The company that was awarded this FDA approval is called Contamac. Contamac is a major British manufacturer of different contact lens materials and technologies. This company is behind the very famous Optimum gas permeable contact lenses. Contamac employees were excited to announce they will soon begin putting Hydra-PEG coating on their Optimum lenses. 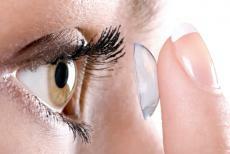 Contamac developed this technology with the help of contact lens research group Tangible Science. Tangible Science's team has been working on Hydra-PEG coating for over a year, and they signed a formal licensing agreement on this technology with Contamac just a year ago. Tangible Science has its main lab headquarters in Menlo Park, CA. To prove how great Hydra-PEG coatings are, researchers at Tangible Science studied whether or not people felt more comfort with traditional contacts or Hydra-PEG contacts. Participants actually said that they enjoyed wearing one-day old Hydra-PEG contacts over five-minute old regular contacts. One of the main features people love about Hydra-PEG contacts is that these lenses do not need to be re-wet at all. The Hydra-PEG coated lenses are designed to absorb water naturally in the eyes, and they also fend off pesky protein and lipid deposits from forming in the lenses. According to Tangible Science's records, the Hydra-PEG polymers can retain a whopping 90 percent of water. Hydra-PEG coated contacts have been shown to handle everyday friction from the eyelids much better than normal contact lenses. People who wore Hydra-PEG contacts said that they experienced far less irritation caused by blinking. Martin Dalsing, who is the current director of global strategy at Contamac, told reporters that he is thrilled to partner with Tangible Science on this venture. He hopes to make Hydra-PEG coating a standard practice in the specialty contact lens market. Dalsing went on to say how there's really no comparison between Hydra-PEG contacts and normal contact lenses. Hydra-PEG lenses have a certain "wow factor," Dalsing said, that gives every contact lens wearer a benefit that can be easily felt here and now.